You are currently browsing the tag archive for the ‘definition’ tag. I’ve seen this topic come up quite often among amateur writers and people tend to give a confuse mix of advice. So should you use a prologue or not? Well, that depends. The biggest problem here is that the majority of people don’t know how to use a prologue, so the first step for us is to determine a working definition to use. There’s a variety of literal and technical definitions floating around the internet but I stand by my own (as I consider it the best amalgamation of the technical and practical). Before I give my definition though, let’s go through some history (so we can understand the technical side). In ancient Greek tragedy, the prologue was the part of a play that set forth the subject of the drama before the chorus entered. Why is this so important? A lot of amateur writers are using their prologue to start telling the story. That’s not a prologue, that’s your chapter one. The prologue has to “set forth the subject”. What does that mean? It needs to introduce the context of the story and it has to be separate to your story (otherwise it’s chapter one). So what is a prologue? It is a distinct and separate entity that introduces a story by providing information necessary for the reader to understand the text. By nature, a prologue should be a little bit of an info dump. To “set forth the subject”, you must provide contextual information. Other information acceptable in a prologue would be back story/history and any particular quirks of your world that will clarify things to the reader (if I start writing about angels, the reader would be confused why the floors of this city are puffy white clouds). It should never connect with your chapter one smoothly, if it does then your prologue is your chapter one. Now, why are prologues bad? Well, first of all, if you’re using it the wrong way you cast doubt on your credibility as a writer. Not a good first impression. Even if you do use it correctly, since prologues are generally info dumps by necessity, your first impression still ends up being somewhat boring. Admittedly, I’m a fan of diving into the heart of things but that doesn’t mean you have to start off with an action scene, it just means you need to open with a hook – your reader has a plethora of other books they could read, give them a reason to read yours. Finally, I’ve been informed by a few authors and editors that prologues are generally skipped by literary agents. Other readers also tell me that they skip prologues too (though personally I read them). The general consensus of the writing world is that prologues can and should be avoided where possible. If you don’t believe me, Google “prologue bad” and you’ll find lists of published authors, writing sites and editors supporting my statement. Perhaps the most cogent example I can give is an example from the Greek tragedy “Medea” by Euripides. As prologues were basically invented at this time for these plays, this is a fitting example. The prologue to Medea features one of the nurses talking to herself (technically, to the audience through the fourth wall) and summarising the past events leading up to this very moment (Jason’s quests and how Medea has helped him, only to be met with betrayal). This back story is necessary for the audience to understand Medea’s grief stricken state, and the psychological damage required for her to eventually commit infanticide as revenge. Without this prologue, the play would just be about a psychotic child-killing mother, but with the prologue, we understand the emotional complexity at play, adding layers and depth to the story, climaxing at the point where Medea snaps under the pressure. The fact that the nurse is relaying this information as a soliloquy instantly sets it apart from the rest of the play, so we know it is a distinct, separate entity. This is what a prologue should be – so please, use your prologues correctly. The Sue couple are a negative feature in writing used to describe a poorly crafted character (where Mary Sue is the female character and Gary Sue the male – obviously). I just say Sue because it’s easier. Anyway, people are a little divided over the true definition of a Sue. I think the main reason there’s so much disagreement is because people are trying to identify specific traits that are representative of a Sue. It doesn’t work that way because writing isn’t so flat and two-dimensional that you can just say a group of traits is bad. Before I tell you my definition (which I think is – if not better – then at least more encompassing), let’s get some history down. The name “Mary Sue” comes from the 1974 Star Trekfanfic “A Trekkie’s Tale”. Originally written as a parody of the standard Self-Insert Fic of the time (as opposed to any particular traits), the name was quickly adopted by the Star Trek fanfiction community. Its original meaning mostly held that it was an Always FemaleAuthor Avatar, regardless of character role or perceived quality. Often, the characters would get in a relationship with either Kirk or Spock, turn out to have a familial bond with a crew member, be a Half-Human Hybrid masquerading as a human, and die in a graceful, beautiful way to reinforce that the character was Too Good For This Sinful Earth. From that passage we can identify two things, a Sue is too perfect and is an “author avatar”, which basically means a character through which the author inserts him/herself into the story (most commonly in fanfiction). As a result, Sues have been categorised as having traits such as “too strong, too beautiful, too whatever”, which can collectively be considered as being too perfect. Others argue that Sues are when the author projects themselves into their story (refer to Twilight rant). By projecting themselves, I mean a writer who creates a character representing certain aspects of his/her own personality, and makes good things happen to that character to compensate for a feeling of inadequacy in real life. These are very subjective measures though, hence the debate over the meaning of a Sue. The problem is that sometimes, your character may have traits that would normally be considered a Sue trait, but is not when placed in context of your story. Here’s how you can prove what I just said – take your most original character and do this test: http://www.springhole.net/writing/marysue.htm. You’ll find that you get a far higher Sue score than you’d think (try and be objective here and admit if you’re overpowering your main character). Here’s a clearer explanation from me (the Sue test is just for fun – I make a lot more sense than it does). Just because your character has some traits that liken to Sue traits does not make it a Sue – it all depends on your story. For example, if you’re writing about a pickpocket-turned-hitman from the slums of a medieval setting, having him/her being ridiculously good looking, charming and the most sought after sexual target in the story is sort of pushing it. Not only is that ignoring the setting (hygiene was no where near current levels in medieval times), but it’s ignoring the fact that the character is from the slums. Even if you made the setting a modern day society, things get questionable when your character is far too attractive. If you throw in a few too many good traits, you’ll have a Sue. Next example: what if you’re writing about the political side of heaven, where angels debate whether they should interfere with the devil’s work on Earth or let things run its course? Well, it makes sense if your character is good looking because he/she is a freaking angel – they’re all meant to be good looking. As for Author Avatars, well, it’s one thing to take out your insecurities on a character and it’s another to base your characters off real human emotions. The distinction can be blurry to a reader, but I think the latter makes for a much stronger and more believable character. They key here is to include both good and bad traits – perfection is your enemy (unless you’re writing about angels)! So, what is a Sue then? My definition is: A character that is unrealistic within the reality and mechanics of your fictional world. Unrealistic encompasses both perfection and a lack of emotional range. Realistic characters will have strengths and weaknesses. As a writer, you need to make your story engaging, and it isn’t when your character is unbelievable. This definition does not limit your ability to use supernatural abilities, magic, sci-fi technology or anything else “unbelievable” in modern day terms because these things are explainable within the reality and mechanics of your world. If you write a sci-fi, then technology is explainable. If you write about magicians, then magic is explainable. They are not unrealistic in your world. But if you write about cavemen, except your main character has a giant robot mecha suit and uses it to conquer the stone age, then yes, you’ve gone too far. People on the internet have been alternating between excessive incorrect usage of the word swag and frustrating confusion over its meaning. And no, those stupid acronyms aren’t funny or accurate. I’m here to shed some light. The English definition of the word swag is an ornamental arrangement of flowers, fruit and greenery. So yes, from a linguistics point of view, the little kids online posting swag pictures sound very stupid now. Forgive me the shoddy work, I was too lazy to open Photoshop so I did this with an online editor. Anyway, swag can also be slang for loot, promotional items or a bundle of belongings. These days, swag has taken on a new meaning that is roughly encapsulated by the synonyms “attitude” and “style”. However, I have seen some ridiculous usages of the word swag that not only violate their English definition, but also have nothing to do with their new “definition”. As for how the word came to be used in this way, I’m not absolutely certain but based on my understanding, it originated from the LA style dance scene in which studio dancers would compliment their peers on having “swag”, as well as by throwing kicks and caps at them, which was basically the shortened form of swagger (moving with attitude and confidence). I heard this term used frequently when I started getting into LA style about four or five years ago, which (I think) pre-dates the incorrect usage of the word now. Keep in mind, LA dancers were probably using that word long before I started getting into it, so I’m quite certain this is the origin of the contemporary usage of “swag”. Now, how did the word spread outside of the dance scene? Hip hop artists like Chris Brown sometimes associate with LA dancers. Ian Eastwood choreographed for “Cat Daddy” (that’s what he told us at his workshop anyway) and I’m sure many other dancers frequently work behind the scenes for singers. In addition to dancing, they adopted the LA style’s clothing and eventually, their language. 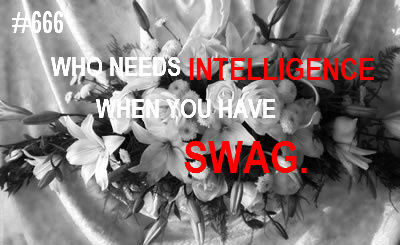 That includes the word swag. These hip hop artists then spread the word “swag” to the mainstream through their music. As we all know, the mainstream comprises of 99.99% impressionable idiots lacking any sense of their own identity, and as a result, they were all quick to jump on the “cool wagon” like ignorant, mindless zombies. Now, I profess to using the word swag in its new definition too, but that’s only because I use it in a street dance sense. I don’t want to sound like a self-entitled prick but I think I’m allowed to use it more than some kid who uses it as an excuse to drop out of school, knock up some girl, work a minimum wage job to pay for her and the child, get divorced because it’s too tough and pay child support, bounce between minimum wage jobs for the rest of his adult life, and die a lonely man. Oh, but a lonely man with “swag”, apparently.